I’m very set in my ways when it comes to luggage. After 20 years of travelling, I’m pretty sure what I like. For short trips, it’s a wheel-on bag, small enough to fit in the overhead compartment, and (if allowed) an additional laptop bag which sits neatly on top of it. If I travel on Easyjet (which only allows one bag onboard) I’ll forego the laptop bag and slip the laptop or iPad into the wheelie bag. Finally, if I’m going away for longer than five days, I have a larger wheelie bag which allows me to pack a suit or jacket, shirt and trousers without it being destroyed, and I check that bag in. I’m pretty happy with those combinations. I wait for a shorter trip, one when as I’m not taking a laptop but instead relying on an iPad, I can do without the laptop case, so I decide to try it out. The bag’s main USP seems to be that it contains a new system for packing clothes in a small space without them becoming creased. They call it a ‘Torso Protection System’ (TPS) which I suppose fits in with the whole Urban Warrior Range. Wearing a suit for a meeting, I pack a pair of trousers, two extra shirts, a jacket, pair of shoes, and the normal sleepwear, toiletries and some magazines to read, and then head off to the airport. The first point is that that the case has no outside pockets. It means you can’t slip any documents or newspapers into it without unzipping it, and when you get to security you have to unzip it again to extract the iPad and the toiletry bag. 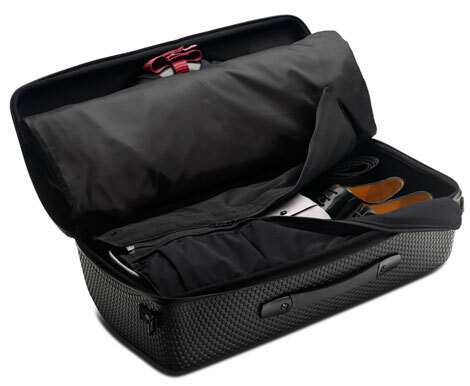 This wouldn’t be too bad, but the bag has a system (“an additional kit chamber”), for enclosing shoes and other loose items in one half while the top half has your suit, which has been rolled into that revolutionary new crease free packing system, of which more later. I found the constant opening and closing of the bag to be a bit of a pain, and wished there was some sort of outside pocket, but perhaps it’s a design thing. That said, it’s certainly striking, and I could see people looking at me wondering what sort of musical instrument was in there – the wrong shape for a trombone, perhaps a new violin case – they weren’t sure. I could tell people wanted to touch it as well, since it looks as though it is made from some kind of artificial crocodile skin (in fact it’s an “impact and water resistant armoured shell.”) Even fully loaded, the bag was extremely light and, as far as I could tell, strong. One point though is that when you alter the shoulder strap invariably the buckle ends up on your shoulder, albeit in the padded cover, which isn’t the most comfortable arrangement. That said the real test was how my jacket and shirts would fare having been almost rolled up into a ball, and on that the bag was amazing – better even than the various garment bags I have which mostly fold the garments in three. Although I missed my wheelie bag, the Red-Eye was infinitely superior to the internal suiter I have in my Victorinix roll-on, which incidentally, is the worst bag I have ever bought. 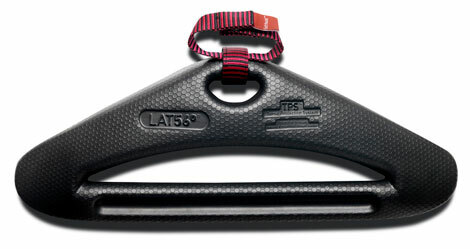 The TPS comes with a big hanger made of “injection moulded Polycell.” which gives good shape to the shoulders of a jacket and is non-slip, so everything stays on the hanger, and in fact, when I got to my hotel I simply hung the jacket in the wardrobe, without transferring it to the hangers provided in the hotel. By the time I came home a couple of days later – with more things than I went with – papers, a few gifts – the bag was jammed full but still performed well. Verdict: truly different, very light, striking looking, and with a superb garment system inside.